Blue Lizard Sunscreen offers the most advanced formulations available in sun protection. Blue Lizard Australian Sunscreen uses the highest quality ingredients which provides clinically proven, broad-spectrum UVA and UVB protection in a mineral-based, water-resistant, SPF 30+ formulation. One thing that makes Blue Lizard unique is that every bottle is a patented BPA-free Smart Bottle that changes colors when in the presence of harmful UV rays which reminds you to apply sunscreen. For instance, the Sensitive bottle turns blue, and the deeper the blue it turns, the more UV rays that are currently present. The Baby bottle turns pink. Again, the deeper the pink, the more UV rays present. 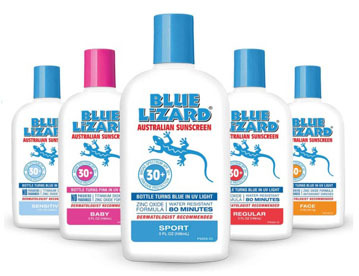 Blue Lizard Sunscreen is available in 5 variations: Baby, Face, Regular, Sensitive, and Sport. 4 sizes are available.